The purpose of a job interview is to share with the interviewer(s) your skills, education, and experiences that deem you competent to conduct the responsibilities of the position. Interviewing is a skill that with time and practice can be improved. Below are a number of tools and tips that will help to build your confidence and strengthen your interview skills. What Does Career Path Look Like? Practice interviewing with a pro. Career advisors will shape practice interviews to a job description of your choice. Or they could focus the interview on one specific competency area such as leadership abilities or cultural competence. You'll get written and verbal feedback on your interview performance and tips for improving. Mock interviews are offered on Mondays, and you can sign up for multiple sessions throughout the semester. Schedule a mock interview by calling the Warrior Success Center at 507.457.5878. 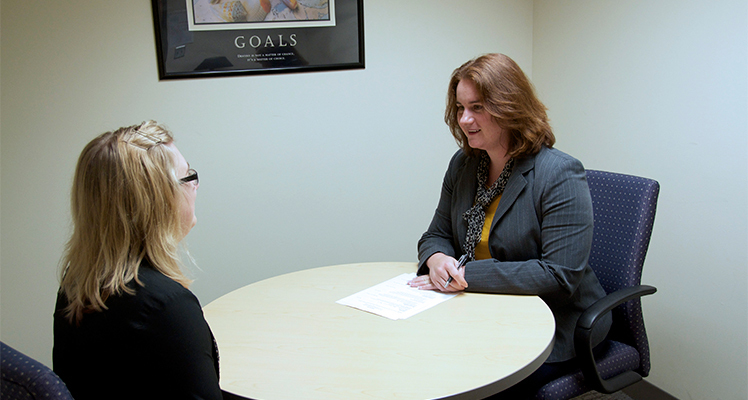 Career Services host employers to conduct job interviews in the Warrior Success Center throughout the academic year. Log-in to your Handshake account. On the left side, choose the Interviews drop-down menu and select Interviews to see all upcoming interview schedules. To sign up for an interview, you will need to have your resume and any other required documents uploaded prior to applying for the position. After applying, the employer will decide if you will be accepted for an interview and will notify you via email. Avoid verbal fillers such as "um," "ah," or "like"
Need to practice? InterviewStream is an excellent tool for anyone wanting to enhance their interviewing skills. It is a private and free way to practice answering the most asked interview questions from anywhere in the world. You just need a laptop or desktop with a camera and internet access. You can also download the App (keyword: InterviewStream) to your iPad, tablet, or phone. From your email select "Click Here to Login"
Select "Conduct an Interview" or "Mobile Interview"
Select "Created for Me" or "Custom Interview" to choose the questions that you would like to practice answering. Align yourself in front of the Webcam and then click begin! Once your interview is completed you will receive an email with a link to your recorded answers. If you would like us to set-up a customized question set for your class please email career@winona.edu with your request.